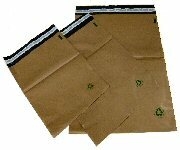 Unlined self-seal poly courier mailers. We now offer you two choices: unlined white poly mailers and our brand new eco-friendly biodegradable unlined poly mailers. 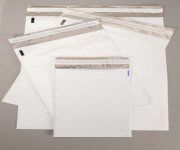 These strong (2.5 mil) lightweight plastic shipping envelopes are water, puncture, tear and tamper resistant. They are made from 100% recyclable polyolefin plastic. These mailers are USPS, FedEx and UPS approved. 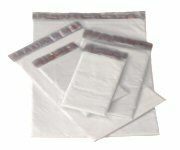 Ideal packaging solution for items that don’t require cushioning, such as clothing and other soft goods. Need a small quantity of several sizes? Browse these categories under "Unlined Poly Mailers"